Our Easter Service is taking place on Wednesday 28th at 9:45am in the church. Following the service there will be tea, coffee and cakes in the school hall (any donations of cake would be greatly appreciated). This year we are having an Easter biscuits/small cakes competition. · There will be a prize for the winners from each class – voting will take place in the hall during tea & coffee time. 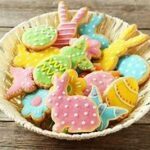 We hope you and the children will have fun cooking and decorating Easter/spring themed baked goodies.